An action packed suspense movie A Murderer's Guide to Memorization. Its the upcoming movie for 2016. Its a novel; based story of a murderer/serial killer role played by Sol Kyung-Gu who after the time passes suffer from a disease name Alzheimer’s. Its a very common disease shown in most of tv dramas where the victim forgot his memories for short or long time period. Seol Hyun will be the lead cast we recently saw her in Orange Marmalade and Gangnam Blues. For Kim Nam-Gil it been too long we watch him in Bad Guy a sad character which made us cry a lot. 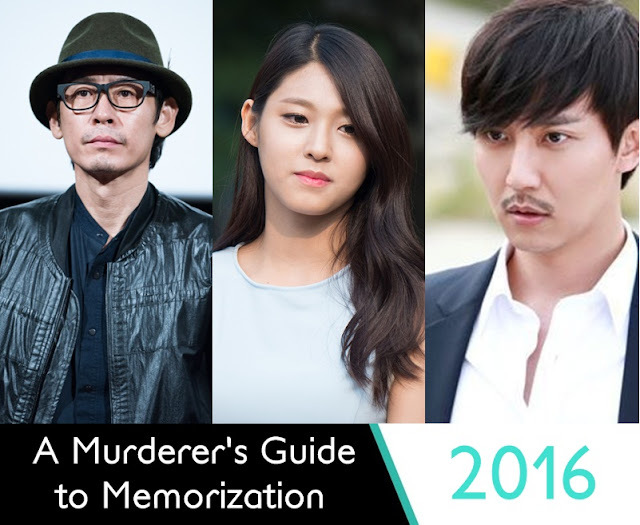 The story of A Murderer's Guide to Memorization is about a past of Byeong-Soo (Sol Kyung-Gu) was a serial killer. He now suffers from Alzheimer’s. Byeong-Soo has a daughter, Eun-Hee (Seol Hyun), but he actually took her from one of his victims. One day, he remembers Eun-Hee's boyfriend (Kim Nam-Gil) approached Eun-Hee to kill her. To protect Eun-Hee, he fights to keep his memory and he plans to kill Tae-Joo. The plot seems interesting hope to watch the movie when uploaded on internet.